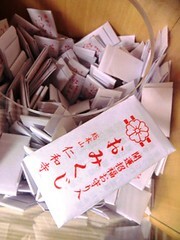 This omamori is a somewhat complicated historical and literary reference. The simplest explanation is that there was once a famous instrument (a biwa, a type of lute) named Seizan that was kept here at the temple. Unfortunately, the original has been lost, but we know of the instrument’s existence thanks to historical record. The more detailed story behind this omamori is found in those historical documents. This biwa appears in the famous The Tale of the Heike. We are told that it was named “Seizan” (青山 “green mountain”) for the painting that decorated the front of the instrument. The painting depicted the moon rising above a lush green mountain in summer. Seizan was made in T’ang Dynasty China and was transmitted to Japan during the reign of Emperor Ninmyō (833-850). Taira no Tsunemasa, a character in the The Tale of the Heike who is very talented at courtly arts including playing the biwa, brings Seizan to Ninna-ji Temple for safe keeping during the war. Tsunemasa had spent time at Ninna-ji as a child and was entrusted with Seizan for some time before he returns it to the temple. Sadly, Tsunemasa later dies in battle. In the Noh play “Tsunemasa,” a monk at Ninna-ji holds a service to pray and mourn for Tsunemasa. Tsunemasa hears the prayers and appears at the temple as a ghost. He speaks of his longing to enjoy the courtly pastimes he once loved, and plays Seizan once more and performs a dance before disappearing back into the Asura Realm (an unpleasant realm where demigods are constantly at war). You can read the entire script of the play (in Japanese and English!) as well as a more detailed synopsis here at The Noh.com. Feel free to use the information in this post to explain your Seizan omamori to your friends, Japanese or otherwise they will be very impressed with your knowledge! 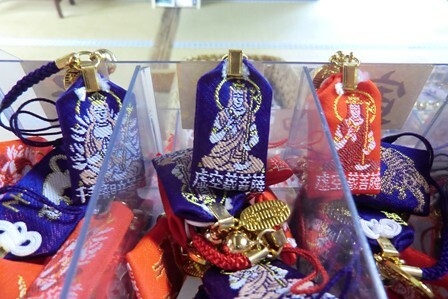 At the temple shop we offer many types of omamori including these Chinese Zodiac charms. Each charm is woven with the image of the zodiac animal on one side and a depiction of the appropriate Buddhist patron deity. These charms are for general luck and well-being. They are available in two colors for all animal signs: indigo and red. The Chinese characters used to write the names of the animals as you see above are characters used specifically to refer to the zodiac. When referring to the common rabbit, monkey, or tiger (and all of the other animals) different characters are used than the ones you see above. The English translations are written in order from right to left, top to bottom as they are in the display at the temple shop. Take the time to remember the character for your zodiac animal (and maybe those of your loved ones!) and it will make it easy for you to find the omamori, or other zodiac-related goods, you seek! Here you can see the weaved images of the patron deities for the first three signs (left to right: rat, ox, and tiger). On the left is the Thousand Armed Goddess of Mercy for Year of the Rat and the other two are color variations of Akasagarbha (Kokuzō Bosatsu), the patron deity for both the Ox and Tiger. 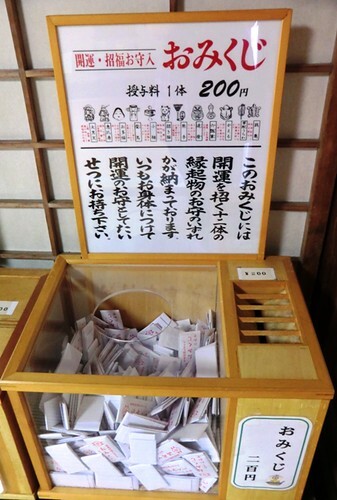 Like many shrines and temples, Ninna-ji has omikuji (fortunes) available for your fortune-telling needs. There are many different ways to choose a fortune, they might be sold in a vending machine that gives you a random fortune, you might be instructed to draw a numbered sticks discover which fortune is yours, or you might simply pull one fortune out of a bin. You might find fortunes that have English translations on the back, but just in case you find yourself with an all Japanese fortune, I will introduce some of the main types of luck being described on most omikuji. There seems to be some different understandings about the exact hierarchy, I referred to this site (in Japanese) to order the levels. The general level of luck is easiest to understand, after that there are fortunes for specific things in your life. I can offer you some common categories but the details depend on the fortune in question. I referred to one of our omikuji for these categories and noticed that the categories are spelled one way and pronounced another. The meaning remains the same, but be careful about using these kanji and reading combinations outside of omikuji. There are two types of omikuji at Ninna-ji, the type below costs ¥200 and come with a little charm that is any 1 of 12 possible designs. They are all in Japanese, though, so have a dictionary handy if you need one! 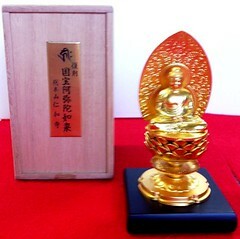 You can purchase a miniature replica of Ninna-ji’s statue of Amida Buddha at the Tokyo National Museum’s gift shop for the Kukai exhibit. Quantities are limited and we currently do not offer these at our shop here at the temple, you can only find them at the museum in Tokyo. You could have your very own portable, mini national treasure for the price of ¥5000! In Japan, tortoises are said to live for 10,000 years. These mythical tortoises often are depicted with long flowing tails. This charm takes the form of one such tortoise and offers its owner health, long life, and safety when traveling. 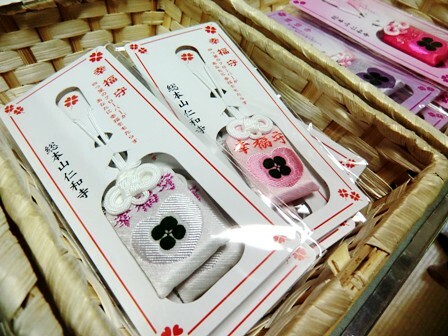 Ninna-ji has a variety of charms made from a Japanese fabric called chirimen (known as crape in English). 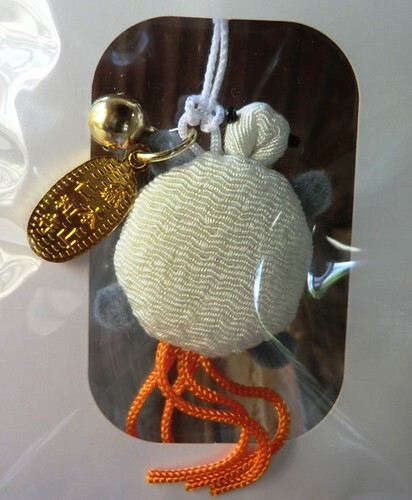 I really like the chirimen charms and think that this tortoise is one of the cutest ones we have. The upper part of his shell uses a fabric that looks like shibori, a traditional Japanese method for dying fabric. He has beads for eyes and as you can see on the view of his underside, there is a bell and a little nameplate attached that says the charm is from Ninna-ji. 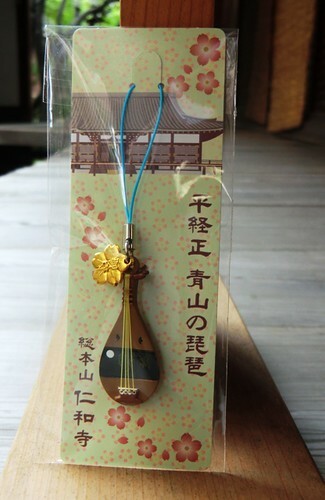 Omamori really are great souvenirs from your visits to temples and shrines. Be sure to take a look at the shops at the places you visit for helpful little charms like this one! There are two versions of this clover omamori, the one above for happiness and another for luck in romance (visible in the background). Both versions contain an actual four-leafed clover! This is a popular charm for several reasons, one reason is because it makes an appearance in a well-known manga. Boku no Hatsukoi wo Kimi ni Sasagu or “I Give My First Love to You” is a manga by Kotomi Aoki that won the Shogakukan Manga Award for best shōjo manga for the year 2007. 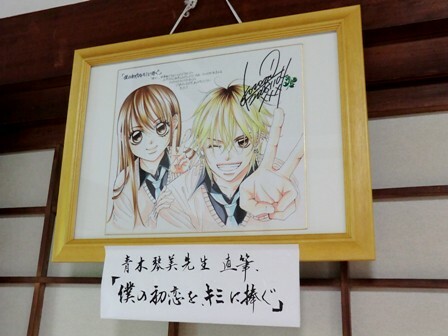 In the temple shop you can see Kotomi Aoki’s autograph which given as a gift to the temple. The two main characters in the manga visit Ninna-ji during a school trip and exchange clover charms purchased at the temple. 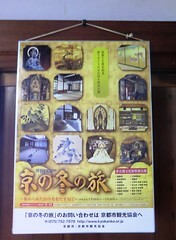 Ninna-ji and the charms appear several times in the series. We have some volumes in which Ninna-ji is featured at the temple shop, while they aren’t for sale we would be happy to show them to you! 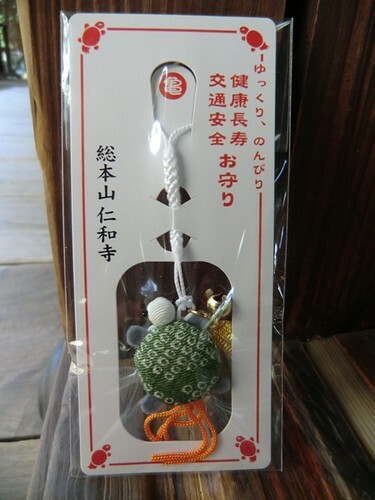 Fans of the manga series, many of them visiting on their own real-life school trips, often take home a clover charm as a souvenir of their visit to the temple. A film version of the series was also released in fall of 2009, but from what I can tell from the synopses online, it doesn’t appear that Ninna-ji makes it into the movie adaption. If any one has seen it and can confirm or deny this, let me know! Unfortunately, unlike Aoi Festival and Mifune Festival, there aren’t any depictions of Gion Festival here at Ninna-ji. However, Gion Festival is one of the big three festivals of Kyoto, so although it is not directly related to Ninna-ji, I feel that a brief post is a must! 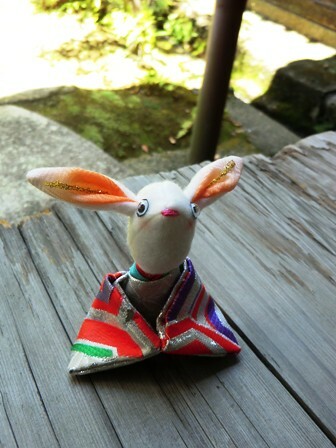 One of the Chinese Zodiac bunnies constructed with Kyoto-made fabric from the temple shop is going to have to stand in for a photograph of something Gion Festival related. I apologize that I cannot offer something more on-topic, but I do hope you find his serious countenance as endearing as I do. Gion Festival is actually a month-long occasion, but the parade (largely considered the main event) happens this weekend on Sunday from 9am to 1pm. On the evenings leading up to the parade (starting tonight!) you can go see the completed floats (yamaboko) and enjoy the amazing festival atmosphere down near the intersection of Karasuma and Shijō streets. On the day of the parade, I recommend finding a place to watch that will allow you to see the floats turn a corner, I think it is the most impressive part of the procession!